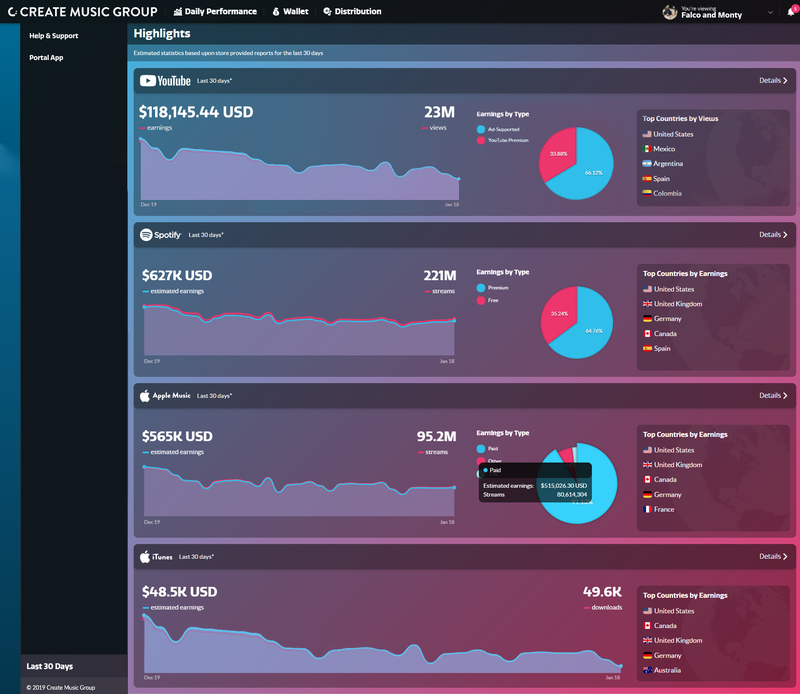 Los Angeles-based distribution and services company Create Music Group has made what it calls a “revolutionary” update to its client-facing platform. The firm has today (January 28) unveiled a distribution console upgrade which enables its artists to instantly access daily net royalty figures from YouTube, Apple Music/iTunes and Spotify. Create co-founder and Chief Operating Officer Alexandre Williams (pictured) explained to MBW how Create was able to offer clients this data, which he said was “something artists have never seen before from any distributor”. The company’s Client Portal bases its daily earnings reports on the latest royalty information Create receives from Spotify, Apple or YouTube for each of its artists. Its software then uses this data to determine a per-stream royalty rate across different platform tiers (premium, free etc.) as well as in different individual markets. The plays in all of these regions, on all of these services, are then processed by Create’s portal, which calculates an estimated net earnings figure (see below). While Create already shows clients’ daily publishing royalties from YouTube, in the coming months its says the Client Portal will also implement daily publishing royalties on the same dashboard from other major DSPs too. Added Williams: “Sometimes, being an artist is a self-deprecating and difficult existence, but we on the distributor side know how much success there is out there. We’re seeing more and more clients earning $5,000 or $10,000 or $20,000 a month just from [streaming] services. Create’s Client Portal also provides daily revenue figures for collaborators on each creative work, making it a useful tool for producers, songwriters and other contributors to a track. Create, which was founded in 2015 and become best known for its retrieval of unclaimed YouTube royalties for dance and hip-hop artists, recently hit headlines for inking a multi-million dollar deal with Tekashi 6ix9ine. It now takes care of publishing and distribution for the controversial rapper, who was previously signed to Universal. In total, Create currently monetizes more than 9 billion music streams per month for its artist and songwriter clients. Williams further commented: “Converting streams to net earnings is no easy feat in such a dynamic landscape, but with our new Client Portal we are bringing an unparalleled level of immediacy and transparency to our distribution clients. KP has now formed a record label, The DisPensary, which utilizes CMG’s technology stack and distribution service. Create says that it has paid its clients in excess of $60 Million in royalties over the last three years. It entered the full-service distribution business in 2016 with the acquisition of the independent distributor Label Engine.